*If you have any questions or concerns about any of these events, please contact me! We had a great visit to the APPLE Store at the Cherry Hill Mall. Check out the slide show on Seesaw. They showed us some tricks to use iMovie. Each student that attended the program got a "flash drive" bracelet and T-shirt. A good time was had by all! Stoy students and store employees! We are involved in an exciting and experimental cross grade/cross school project. 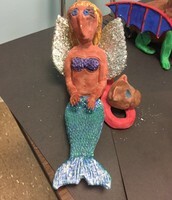 The project evolved after I worked with Mrs. Karen Kiick, the high school art teacher. We wanted to collaborate on a project that involved art, writing, and technology. 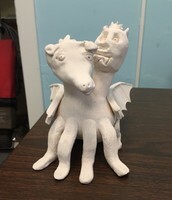 She invited the second graders in Mrs. Tallman's class to write a description of a 2 headed creature. 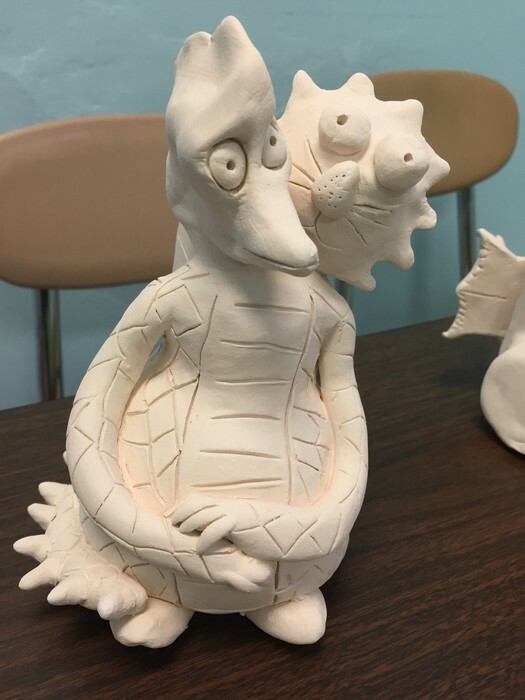 She went to their classroom and they created the "heads"out of clay. 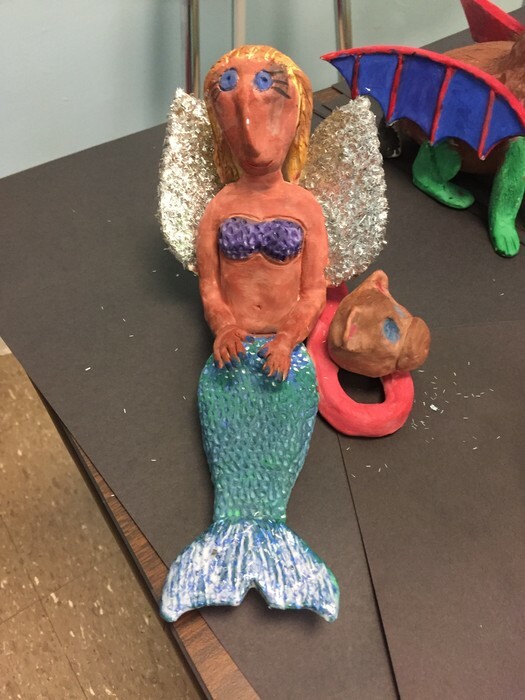 Mrs. Kiick took the "heads" back to her high school students and they created the bodies based on the descriptions written by the second graders. Last week she brought the "creatures" to our classroom. Our task was to paint them using the second graders' descriptions and then come up with a "tech" idea involving the creatures. We decided to use the class green screen to create a Newscast featuring the creatures on the loose. Each group will be writing a news report and acting as if they were on the evening news relaying the information about their creature sighting. YOUR CHILD MAY ASK TO FILM A SETTING OR TAKE A PICTURE OF A SETTING THAT WE WILL USE AS THE BACKDROP FOR THEIR NEWS REPORT. They may need your help in getting to the place they want to use for the backdrop. We can't wait to see the finished products and have the chance to meet everyone that was involved in creating each creature! We hope to unveil our project at the ART EXTRAVAGANZA! 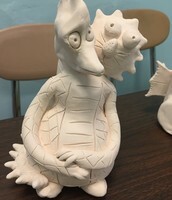 Here's a glimpse of one of the unpainted creatures! So cool! This is Mary, Claire and Anna's creature! I can't wait to hear about its adventures! Love the glitter wings! Another unpainted creature. Groups of 2 or 3 students are working together to paint and write a news report of their creature on the loose!